A Cap of Maintenance is a ceremonial cap of crimson velvet lined with ermine, which is worn or carried by certain persons as a sign of nobility or special honour. 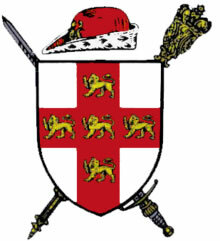 As such, it is often to be seen depicted in British heraldry. A Cap of Maintenance is one of the insignia of the British sovereign, and is carried directly before the monarch at the State Opening of Parliament – usually by the Leader of the House of Lords. For their coronation, Kings, up to and including George VI, have usually worn the Cap of Maintenance for the journey to Westminster Abbey immediately prior to the service. Queens regnant have instead tended to wear the George IV State Diadem. In more general terms, the velvet and ermine lining of a crown (or of the coronet of a peer) is itself sometimes called a ‘cap of maintenance’, and is technically a separate item to the crown itself. According to the Oxford English Dictionary a Cap of Maintenance was granted by the Pope to both Henry VII and Henry VIII as a mark of special privilege. The origin of this symbol of dignity is obscure. It may have had a purely practical origin being used to help a crown fit more firmly or to protect the head from bare metal on the crown. It is probably connected with the cap of estate or dignity, sometimes also styled Cap of Maintenance, similar in appearance to the above but with two peaks or horns behind, which is borne as a heraldic charge by certain families. This seems originally to have been a privilege of dukes. Where it is used the crest is placed upon it, instead of on the usual wreath. A Cap of Maintenance of a different design is worn by the Swordbearer of the Lord Mayor of the City of London. The Lord Mayors of York, Bristol, Coventry, Lincoln, Newcastle-upon-Tyne, Norwich, Worcester, Hereford, Exeter and Hull also have this privilege. Early charters granting the right to use of a ceremonial sword often mentioned the right to a Cap of Maintenance in addition. In the City of York, the original medieval Cap of Maintenance is kept and displayed in the Mansion House of the Lord Mayor of the City. It was given to the sheriff of York by King Richard III, who was of the York dynasty. It is still used on special civic or ecclesiastical occasions, such as the celebrations in 1996 marking six hundred years of the royal charter giving its Freedom to the City of York.